The Killers, is a 1964 gangster film, directed by Don Siegel, starring Lee Marvin, John Cassavetes, Angie Dickinson, Clu Gulager and Ronald Reagan, and released by Universal Studios. The picture was the second Hollywood adaptation of Ernest Hemingway‘s short story of the same name, following a 1946 version starring Burt Lancaster and Ava Gardner. The movie remains notable for being future U.S. president Reagan’s last theatrical film before entering politics, as well as the only one in which he plays a villain. The Killers is undoubtedtly a film about gangsters. There is hardly a character in the film who isn’t on the wrong side of the law. If anything distinguishes this film from the 1946 Killers directed by Robert Siodmak, it is its refusal to consign the characters to a film noir hinterland of encroaching shadow and fatality, to accept a moral and pictorial tunnel vision. Crime here takes place in daylight, in a bright, everyday world. The picture was originally intended to be one of the first television movies – was filmed under the title Johnny North,- but after the John F. Kennedy assassination, NBC judged it too violent to broadcast, so Universal released the film theatrically instead. At the time of release, Lee Marvin said that it was his favorite film. He received the 1965 BAFTA Award for Best Actor for this role as well as for his role in Cat Ballou. 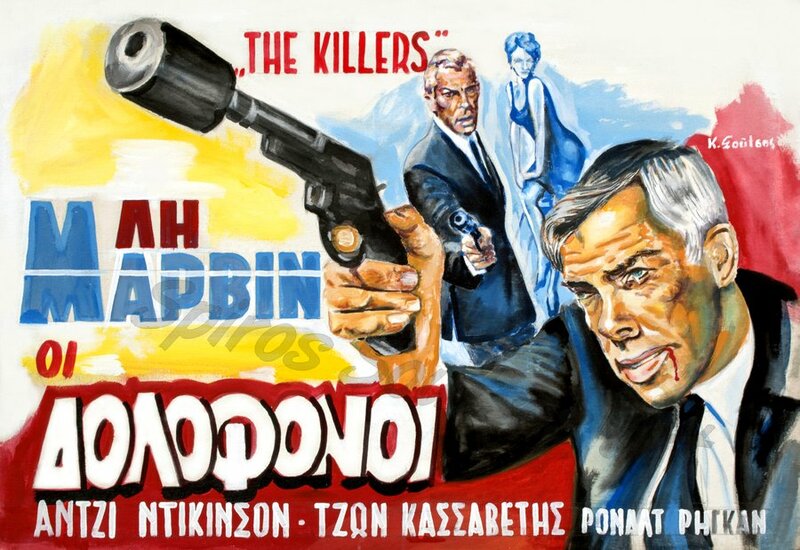 Lee Marvin’s role as Charlie Strom, a middle-aged hitman, is memorable. We first see Strom reflected in his associate hitman’s (Gulager’s) sunglasses as the two men, both in dark and tailored suits, march into a school for the blind and shoot racing driver Johnny North (Cassavetes). Small signals he makes control the film, directing the other characters so he doesn’t have to raise his voice. Seating himself across from Sheila (Dickinson), an untrustworthy mob wife, he crosses his legs, removes his hat, shoots his cuffs and crosses his arms. “What do you want?” she asks. “The money,” he answers, giving the definitive interpretation of those two words but sounding like he’s ordering lunch. We see Strom in the end of the film, clutching a briefcase, bleeding on a suburban lawn. Marvin is the alter-ego of Steve McQueen. Not handsome, unconcerned with the audience and therefore compelling, he is distant and takes things personally. He is too smart to be monumental like other movie stars, but when he falls it’s like a world got killed.